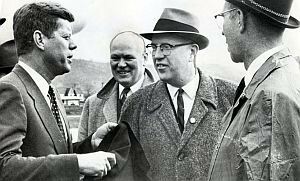 JFK had a packed campaign day in Oregon. He greeted local officials and campaign staffers including State Rep. W.O. Kelsey and aid Edward Murphyin his first stop in Roseburg, where he addressed the Democratic committee. He then visited the local lumber mill and gave a speech on housing. He was then off to Corvalis to meet with the local Democratic Committee and a local Democratic Women’s group, and to give a speech at the Benton Hotel. It was on to Albany, Oregon to give a speech at St. Mary’s Hall and then finally heading to Portland, Oregon where he stayed at the Multnomah Hotel.